and respected,they were the custodians of our traditional cultures and beliefs. The words and decision of the king is law and everyone must obey. are still a handful of powerful kings (traditional rulers) that still command the respect of thousands of people across Nigeria. This post contains the list of the top 10 most powerful kings in Nigeria 2019 in no particular order. The Emir of Kano is one of the most powerful and respected King in Nigeria.The title commands respect from millions of muslims in Nigeria. The current Emir of Kano is Mallam Muhammad Sanusi II,he was formerly the governor of the Central Bank of Nigeria. His predecessor Alhaji Dr. Ado Bayero ruled for 51 years before his death. The title of Oyo is a much respected title among the yorubas. The Alaafin Of Oyo is regarded as one of the most powerful kings in Nigeria. The ruling Alaafin of Oyo is Lamidi Olayiwola III,who is the successor of AlaafinGbadegesi Ladigbolu II. In ancient times the Alaafin Of Oyo was seen as a supreme leader by the yoruba people. The title of the Sultan Of Sokoto has been held in high esteem,he is seen as the spiritual leader to millions of Muslims in Nigeria. This position was respected dating back to the era of the British colonization. The current Sultan is Muhammadu Sa’ad Abubakar IV,he was the successor of his brother Muhammadu Maccido who lost his life in a plane crash. Ooni of Ile-Ife is also one of the most powerful kings and title in Nigeria. The current Ooni of Ile-Ife is Oba Ogunwusi,while the previous Ooni of Ile-Ife is Ooni Okunade Adele Sijuwade. The late Ooni Okunade Adele Sijuwade was one of the richest kings in Nigeria before his death. According to rumors,the Ooni of Ile ife has a strong role in determining who becomes the governor of Osun state. The Dein of Agbor made history as one of the youngest kings to ascend to the throne after the death of his father. The current Dein of Agbor is called Benjamin Ikenchukwu Keagborekuzi. The Oba of Benin is also one of the most powerful kings in Nigeria. The current Oba of Benin is Oba Ehinede who succeded his late father Omo N’Oba N’Edo Uku Akpolokpolo Erediauwa. The title of Oba of Benin dates back to the ancient Kingdom of Benin before the invasion of the colonial masters. The oba of Benin also plays an important role in issues regarding to politics in the state. The Oba of Lagos is the traditional ruler and ceremonial head of one of the largest cities in Africa. The current Oba of Lagos is his Royal Highness Oba Rilwan Babatunde Osuolale Aremu Akiolu,he is also referred to as the Eleko of Eko. The Oba of Lagos is powerful and also very much involved in government politics of the state.Lagos is the most populous city in Nigeria. The Olu of Warri is the traditional ruler and king of the Warri people. The current Olu of Warri is Godwin Toju Emiko who is a lawyer by profession. He is the King of the Itsekiri people. The Obi of Onitsha is a much revered and respected title. The current Obi of Onitsha is Igwe Nnayelugo Alfred Nnaemeka Achebe. He is the traditional ruler and Obi of Onitsha people. 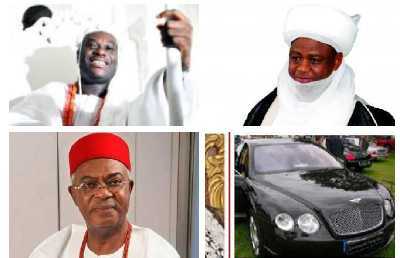 The king is rated as one of the most powerful and richest kings in Nigeria. The Olu Of Ibadan is a very prominent title held by Oba Saliu Adetunji. Olubadan means Lord of Ibadan.The Title was once held by late Oba Samuel Odulana Odugade before he passed on at the age of 101. Ibadan is an ancient Kingdom and the title of Olubadan of Ibadan has been respected and revered for generations.